Other English names: Corn, Maize. Indian Corn is one of the tallest and most vigorous of the annual grasses. The stems, which vary in height in different types and varieties, are solid, whereas in most other grasses they are hollow. The leaves are long and broad, wavy and gradually tapering towards the apex. The top of the stem bears a large panicle with spreading branches, each of which forms a spike with numerous flowers. These flowers contain only the stamens or male organs and are normally unable to form seeds. The seeds are developed in the ear, a kind of fleshy spike, the flowers of which are arranged in distinct rows and contain only the pistils or female organs. When young the ears are enclosed within a husk of broad leaves and nothing, can be seen of the flowers. At flowering time a cluster of long, slender, yellowish-green or reddish threads protrude from the top, of the ear. These threads, called the silk, are the top ends of the female flowers and catch the dust-like pollen developed in the male flowers and transported by the wind. The development of the ear starts, as in all other inflorescences of grasses, at the base and proceeds upwards. Thus the first visible silk threads belong to the lower flowers, which consequently, under normal conditions, are fertilized earlier than the upper ones. Should the weather during the latter part of the flowering period be unfavourable, the pollen will not be freely transported and deposited on the silk and the upper part of the ear may be partly or wholly barren, as the seeds are unable to develop properly without fertilization. 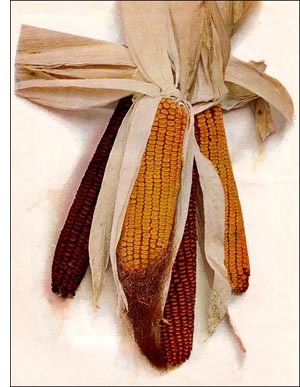 Indian Corn is undoubtedly of American origin. It was grown by the Indians long before the discovery of America. The Incas of Peru are said to have built large storerooms for it, to prevent famine in case of crop failure. It was grown as far north as the St. Lawrence valley when the first explorers arrived there. Ears of Indian Corn are often found in old Indian tombs, deposited with the deceased as provision for the long journey to the happy hunting grounds. Where or when it was first cultivated, or from what wild plant it developed, is not definitely known. It is generally assumed that its cultivation started in Central America and spread north and south. It has never been found wild. This might either mean that wild corn was extinct before botanists could make a record of it, or that it is a plant so different from the cultivated form that it is now impossible to recognize it. The latter assumption is the one generally favoured, and the plant mentioned as the probable primitive form is the Mexican Teosinte (Euchlaena mexicana Schrad.). Although very different from corn in its general appearance, Teosinte is evidently closely related to it, as is shown by the fact that hybrids obtained by crossing the two produce germinable seeds. Though this is not conclusive proof, it is evidence that corn may have developed from Teosinte, for in all other known cases hybrids between distinct grass species are sterile. Being of southern origin, Indian Corn requires a warm, moist climate. In the north, where the season is short and the weather comparatively cool, only the earliest varieties reach full maturity under ordinary conditions. It demands a warm, fertile soil and thrives best in a deep, rich loam, well drained yet stored with abundant moisture. A good supply of organic matter, furnishing readily available plant food, will increase the yield considerably. Poor sandy soils, or soils with the water table near the surface, do not allow the roots to gather sufficient nourishment. In stiff clay, or in soils which form a hardpan subsurface, the growth is slow and the yield uncertain, especially in dry weather. Indian Corn includes hundreds of agricultural varieties. This is chiefly due to the readiness with which cross-fertilization takes place between individuals of different types. Some varieties are dwarfs, no more than eighteen inches high; others are giants, reaching a height of from twenty to twenty-five feet. In some the ears are only an inch or two long; in others as much as sixteen inches. The number of kernel rows, which is always even, ranges from eight to twenty-four or more, according to variety. Abnormal individual ears sometimes have as few as four in some varieties, or as many as forty-eight in the large-eared sorts. The size of the kernels, their shape, colour, chemical composition, etc., are extremely variable. When Columbus landed in the West Indies, he was presented with a kind of bread made from a grain which the natives called " mahiz." From this word is derived the English maize, under which name the plant is known in Europe. Columbus took Indian Corn home with him, but outside of Spain and Portugal the plant was but slowly appreciated in Europe. It is now grown there, especially in Italy, where corn porridge (polenta) is the working man's common food, in Spain, where cakes of corn meal (tortellas) are of great importance, and in the countries along the lower course of the Danube. Latterly it has been grown extensively in Europe, East India and Africa. Its cultivation in Europe, Asia or Africa, however, cannot be compared with its cultivation in America. In South and Central America and in the United States it is grown for both grain and fodder. Its importance as a forage plant increases northwards with latitude; along the northern limits of the corn belt it is grown principally for that purpose. Indian Corn is commonly fed green as a supplement to pasture in the late summer and autumn. It is liked by all kinds of stock, but for soiling it is especially valuable for cattle. It is sometimes cut green and cured into dry fodder, but it is retentive of moisture and difficult to store for winter feeding. When grown for husking, the cured fodder, after the ripened grain is removed, is hard and woody. When cut short for feeding, moistened and left in a pile until fermentation starts, dry corn stover becomes more succulent, is wholesome, and is a cheap, bulky food for store cattle. It is, however, deficient in feeding value when compared with corn cut about two weeks earlier and made into ensilage with the grain. In Canada, corn is grown as an ensilage crop almost to the exclusion of all others. Even along the northern limits of the corn belt the early dwarf flint varieties, such as the common Eight-rowed Yellow, will yield a larger food value per acre than any other forage crop. The type and variety best suited to the production of ensilage in any locality depend on the length of the growing season and the natural warmth of the soil. The maximum food value per ton is obtained from corn that has reached the glazed stage of maturity, or that stage of ripening when the kernels commence to form a hard crust over their surface. The protein or flesh-forming constituents are then of the greatest amount and highest quality, having developed from nitrogenous substances of a much lower feeding value, which were present in liquid form in the earlier stages of ripening. Ensilage made from corn that has reached only the early milk stage is commonly sour, and although valuable for its succulence, it is markedly deficient as a food for stock when compared with corn that has nearly reached maturity. It is of first importance to have ensilage corn capable of reaching the glazed stage, even under slightly unfavourable weather conditions, in plenty of time for harvesting before danger of frost; it is of secondary importance to obtain a large yield of both stalk and grain. As a rule, the most profitable variety to grow for ensilage on average soil-the variety that will give the largest food value per acre-is one that may be depended upon to reach full maturity when grown on a warmer soil in the same locality or on a similar soil not more than forty or fifty miles south of it. Experience in ensilage-making invariably demonstrates the wisdom of increasing the acreage of early varieties rather than of depending on large yielding late sorts for the desired tonnage. For fodder, corn is commonly planted in drills at the rate of from twelve to twenty quarts of good seed to the acre. The drills should be not less than thirty-six inches apart for the short-growing early sorts, and forty-two inches for the tall, late varieties. When two or more varieties of corn for ensilage are to be planted it is advisable to plant them separate, especially if one of the sorts is taller and later in flowering than the other. When the smaller and earlier varieties are planted in mixture with the larger and later sorts the smaller, early corns are usually imperfectly fertilized and the yield of grain from them is reduced.